While I was drifting around at sea, the idea of a November big day was floated by Russ Cannings. The proposed date made me wilt because I was almost certainly going to be on the boat still, but I put on bitter-yet-brave face and said Jeremy Kimm, Ian Cruickshank, and Russ should go on without me. As luck would have it, the date did not work and it was pushed back. I selfishly suggested waiting until I got back and the suckers took the bait! On Saturday, November 16th, I was picked up by Russ and Ian at the totally reasonable hour of 2 a.m. Next, we picked up Jeremy K. at his local Tim Horton's, obtained our birding fuel, and headed up to Duncan. From Cowichan Station to Duncan, we put in a few hours of owling and ended up hearing a handful of Great Horned Owls and a couple Barn Owls before first light. Our first daylight stop was Quamichan Lake and we got the ball rolling quickly. Waterfowl and common bush birds were tallied rapidly. We held out hopes we might be able to pull out Redheads or Canvasbacks, but we settled for our only Ruddy Ducks and Barrow's Goldeneyes of the day and our sought after Ring-billed Gulls. From Quamichan, we traveled our way toward Cowichan Bay and stopped along the way when Ian and I noticed a sapsucker fly across Tzouhalem Rd. We hopped out and found not one, but three Red-breasted Sapsuckers in the area! We realized the shrubs were hopping with activity and decided we should pish and sift through the birds a little before heading on. This turned out to be an extremely good decision as Russ soon exclaimed "There's a warbler... it's a Wilson's!" Wilson's Warbler is a very rare bird in late fall and winter, and this turned out to be the most unexpected species of the day. At Cowichan Bay, we walked the dock road and picked up our hoped for Northern Shrike, Northern Harrier, Swamp Sparrow, and Eurasian Wigeon. At Dinsdale Farm, the Sandhill Crane that has been mixed in with the swans and geese cooperated nicely. At this point, we decided to cut our ties with sites north of the Malahat and head back towards Victoria. Ian had suggested we take a quick run up Stebbings Rd. off Shawnigan Lake Rd. and we debated long and hard about the merits of this potentially time-consuming endeavor. We opted to pull off on Shawnigan Lake Rd. and give a quick listen and perhaps head a little further down if it seemed warranted. The stop did net us our only Red Crossbills of the day, which have been very scarce in lower areas around Victoria. We happened to be birding right at someone's driveway and the lady of the house decided to come out after being called by her husband who had just left, and she proceeded to take pictures of us and Russ' car. At that point, we were all rather underwhelmed by hill folk and decided to continue on to Goldstream. 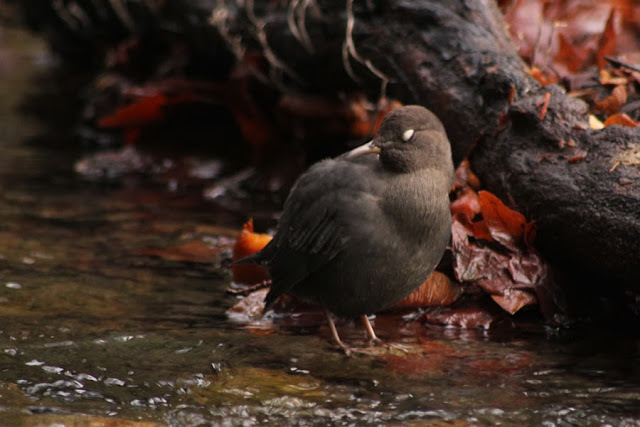 We had only one target at Goldstream Provincial Park: American Dipper. Luckily the spawn is fully on right now and dippers are definitely going to be around. It still took five minutes or so to catch up with one, but we picked up our target. My record shot of the American Dipper just happened to capture its white eyelid - I love that feature! From Goldstream, we knocked down a series of waterfront stops, including Esquimalt Lagoon, Ogden Point, Clover Point, McMicking Point, Queen's Park, and Cattle Point. The wind was up a bit and the seabirding was actually quite difficult. We managed most of the birds you'd expect along the waterfront, but shorebirds were a little hard to come by. Clover Point had Black Turnstones and a lone Black-bellied Plover, Black Oystercatchers were seen on rocks off Kitty Islet, and we managed to find a mixed group with Surfbirds, Black-bellied Plovers, Black Turnstones, and Dunlin on Trial Island viewed from McMicking Point. Queen's Park had the usual combination of Killdeer and Greater Yellowlegs, but the Long-billed Dowitcher and Spotted Sandpiper that have been around the Oak Bay area were nowhere to be found. As we rolled through the Uplands, we had our windows down in hopes of picking up American Goldfinch. Instead, we had Ian's bionic ears pick out a weak White-throated Sparrow song. We backed up and found there was a feeder and when I got out, I located the nice white-striped male on the neighboring yard's driveway. We figured we would need to get one at Swan Lake, so it was a convenient species to pick up on the fly. We stopped briefly at Panama Flats before realizing it was going to be a time sink if we didn't get out quickly. We opted to head over to Viaduct Flats instead and we finally managed to catch up with Canvasbacks. We were starting to near crunch time and needed to stay on the move and limit our stops to places with specific targets. We decided we better make our way over to Martindale Flats as there were numerous species we could get there with a little luck. We headed to Martindale via Dooley Rd. where we hoped to find Mourning Doves. Unfortunately, the yard that has great feeders also had the homeowner out working in the yard. There were many birds around still, but none we were hoping to find! We rolled on through the flats and made a couple quick stops, picking up Savannah Sparrow, American Pipit, and Cooper's Hawk. When we got to McIntyre Rd., we headed down the path and worked our way out to the western edge of Garcia Nursery to look for the Palm Warblers that have been around for over a week. As we passed by the marshy patch by the end of the lane, we finally got to tally Wilson's Snipe. Russ had one at Cowichan Bay, but he was the only one to record it. That was a sigh of relief, and catching up with the Palm Warblers a couple minutes later was also a welcome sight. Next, we crossed the highway and drove down Shady Creek Dr. in hopes that it would have Mourning Doves. They were not there either. This species was proving to be a much harder task than anticipated. We then headed over to the Vantreight bulb fields and I had hoped we would get Western Meadowlark and Peregrine Falcon there. Instead, we got a couple Sky Larks and an American Kestrel. That was actually not a bad trade as it eliminated the need to head to the airport. From my standpoint, this is where the big day got interesting. We were deep in crunch time. It was after 4:00 p.m. and we had to make some tough decisions. We were sitting at 112 species and we had a number of species within our grasp, but we had to pick where to invest our efforts. We started by heading to Saanich Bay because we were missing Greater Scaup and Long-tailed Duck still. We set up on the James Bay wharf and I heard the good news over my shoulder that there Greater Scaup at approximately the same time I found a large group of Long-tailed Ducks. 113 and 114. Perfect execution... now what? This exact moment tormented me because I had a moment where I thought it might be a good idea to walk Saanichton Spit. We could definitely get Western Meadowlarks there, but the Horned Larks that were reported several days earlier could easily be gone. Would Sanderlings be on the shoreline? Maybe we could luck into a Short-eared Owl, Lapland Longspur, Snow Bunting, or who knows what else? It was too late to gamble like that, though, so we decided to retrace our path back to Martindale, including checking a yard along East Saanich Rd. that had a good number of blackbirds and Eurasian Collared-Doves. Mourning Doves eluded us yet again, but there were multiple Brown-headed Cowbirds mixed in with the blackbirds. 115. We continued back east across the highway, then went south along Lochside Dr. Our timing was amazing - a flock of Western Meadowlarks flew over the car and landed in a field on the west side of the road. 116. We went to the pig farm and couldn't add anything. We then headed back to Martindale Rd. and were going to make our way to Dooley again, but were stopped short when two Mourning Doves flew over the car. There was a tense moment when only two of us had seen the doves, but then a straggler zipped by and everyone saw it. Phew! 117. We had tied the old November big day record at this point and we still had enough light to pick up a couple more if we played it smart. We had done poorly with geese at this point. We had seen plenty of Cackling Geese, but we'd missed Greater White-fronted and Snow Geese and we knew they were around somewhere. I suggested we check Mount Newton Valley because it can be good for geese and then if that fails we could continue on to Tod Creek Flats. Well, Mount Newton Valley was barren in the goose department and we added a quick pass by Maber Flats, too, with the same assessment. Tod Creek Flats turned out to be our promised land. When we stepped out to view the flats, it was not long before we had both of our hoped-for geese in our sights. 118 and 119. We did not have much light left, so we figured we had only one option: Swan Lake for Barred Owl, Virginia Rail, and, if extremely lucky, American Bittern. None of those wanted to cooperate. We tried Hyacinth Park for Barred Owl and struck out there, too. We had been up for a long time and were content with our effort, so we decided to give my place a shot for Barred Owl and call it a day. Russ gave his last effort Barred Owl - a rather impressive rendition as anyone that has gone owling with Russ can surely attest - and we all stood around reminiscing for a few minutes. In the distance, a rather ugly hissing screech of a Barred Owl made us all smile. That capped our day off at 120 species. I wouldn't want to claim this record is going to hold up for years to come. We really went in to this with no scouting and we had plenty of misses. I think with a little preparation and luck, a total of 130 would be a solid-yet-attainable total. Thanks to Ian, Jeremy K., and Russ for a great day out and I hope we can get together again soon to try to knock down more records! Great summary Jeremy! Congratulations to all four of you! Thanks, Ray! Maybe the Fur & Feathers 500 can have their reincarnation as November Feathers 125? Come on out to BC and give it a shot!